GERD, gastroesophageal reflux disease, is an issue that can affect some infants. While babies in their first several months of age are known to spit up after meals, in more serious cases frequent vomiting associated with discomfort and difficulty feeding or weight loss could be caused by GERD. There are many factors which may contribute to this condition. Your child’s doctor may recommend changes in feeding amounts and other modifications. Studies have shown that the drugs typically used to treat similar conditions in adults may not be effective in infants, or may have the potential for serious, long-term side effects. Generally, as the child matures, reflux in infants will improve; but for parents seeking to find relief for their child, alternative care can provide a safer option. According to an article by the International Chiropractic Pediatric Association1, out of all the alternative treatments sought by parents for their children with GERD, the most commonly used is chiropractic. A 2016 case study published in the Journal of Pediatric, Maternal & Family Health provides a review of the treatment for GERD that led to a resolution of the symptoms for a one-month old, female infant. The young child was brought to a chiropractor by her mother, who stated she had observed GERD symptoms in her baby including gurgling at night, wakeful sleep, and appearance of grimace, since birth. Symptoms did occur some during the day, but were more prevalent at night. They had tried a prescription of Zantac, but it was unsuccessful at relieving the infant’s symptoms. On the initial visit, the doctor of chiropractic performed a thorough physical examination that included muscle, neurological and sensory aspects. The chiropractor found misaligned areas of the spine, minor asymmetry of the cranium and mild inflammation of the lower back. Other tests were within normal limits. The chiropractic care plan included fingertip digital pressure adjustments (a specialized method used to gently adjust infants) on the child’s lower back and upper neck along with cranial work, and gastric pull-down manual therapy. The infant received chiropractic care during 15 visits over the course of 3 months (twice a week for 3 weeks, then once a week for 9 weeks). Additionally, the doctor instructed the mother to perform stomach massage at home. While this is a single case study, it confirms anecdotal reports of infants with GERD and similar issues successfully treated with chiropractic care. Chiropractors are trained in special adjusting techniques that are gentle enough for an infant. In fact, the technique is so gentle that it is commonly reported that babies have slept through their treatment! The gentle, drug-free approach of chiropractic is not only safe, but also effective for many childhood health issues. Additionally, regular spinal check-ups help ensure your child’s spine is growing healthy and strong. Talk to your chiropractor at your next visit about how chiropractic can benefit your child. If you don’t have a regular chiropractor, you can find a doctor near you at https://www.tnchiro.com/find-a-doctor/. 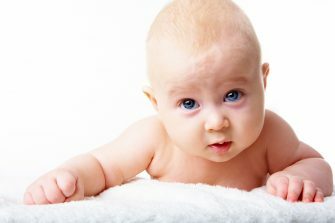 Find more information about pediatric chiropractic at https://www.tnchiro.com/research/children-research/. Ferranti, Melissa, Alcantara, Joel, & Reilly, Ann. “Resolution of GERD in an Infant Following Chiropractic Care: A Case Report & Selective Review of the Literature.” Journal of Pediatric, Maternal, & Family Health. 2016.2 (2016): 46-49.